Upload a picture of "Mannish Water"
Add a YouTube Video for "Mannish Water"
Popular soup normally served at funerals, birthday parties or other large gatherings. 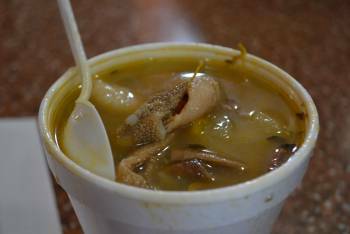 This soup is considered to be aphrodisiac and consist primarily of goat meat as its main ingredient. The goats head, intestines and testicles are sometimes used.